Mill Street Garage Listening Room, opened last year by local resident Jennifer Tillison and local businessman and artist Robert Smartt, has booked another great artist for Ardmore’s listening pleasure. 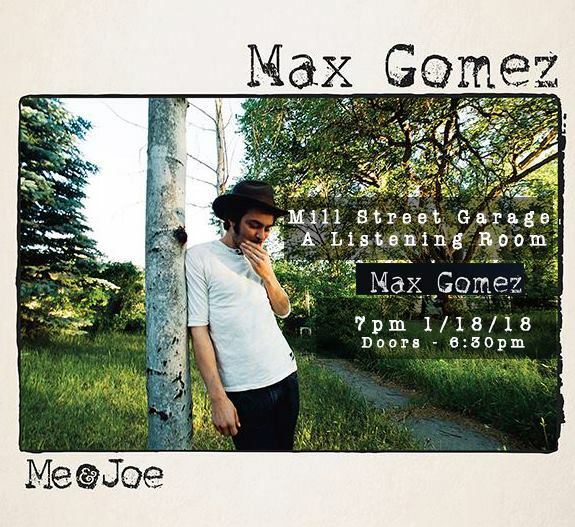 The venue is located at 32 Mill Street NE in Ardmore and on January 18 they are hosting New Mexico singer/songwriter Max Gomez who recently had his latest EP Me & Joe (2017) reviewed in Rolling Stone Magazine. “Gomez delivers his latest batch of songs with an easy twang that arrives at the halfway point between tender folk balladry of Kris Kristofferson and the pop melodicism of Coldplay’s Chris Martin,” said Jonathan Bernstein in that review. Tillison’s whole goal for opening up the venue was to bring in musicians from other areas that local residents may not have the opportunity to see regularly, giving them a chance to branch out musically and become more aware of the vast amounts of great music available. “In Ardmore we have a lot of musicians locally and a lot of talented musicians but I’d like to bring in people that we don’t get the chance to hear all the time, while also incorporating our local talent in with it as well,” explained Tillison. The venue has already hosted several shows including Kaitlin Butts and Charlie Stout, Mike Mcclure and Bryon White, and Courtney Patton and Jason Eady. The “It’s All Good” Food Truck will be on hand with free tacos with the purchase of a ticket, starting at 5:30 p.m. The doors to the venue will open at 6:30 p.m. and the show will begin at 7 p.m. The venue has a BYOB rule in place, being limited to beer and wine for alcoholic choices. Tickets will be $20 and are available at Ticketstorm, and it is an 18+ event. You can visit https://www.ticketstorm.com/event/maxgomez/millstreetgarage/ardmore/20537/ to purchase tickets.